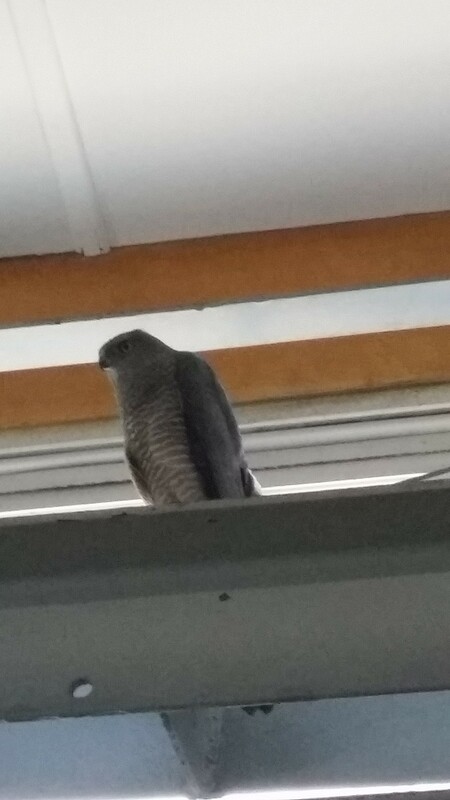 The proximity of natural areas to buildings and infrastructure means that sometimes our wildlife turn up in places where they shouldn’t be.The Brown Goshawk is a large bird of prey with a wingspan of 70cm to 1m, most often seen in Newington Nature Reserve forest. 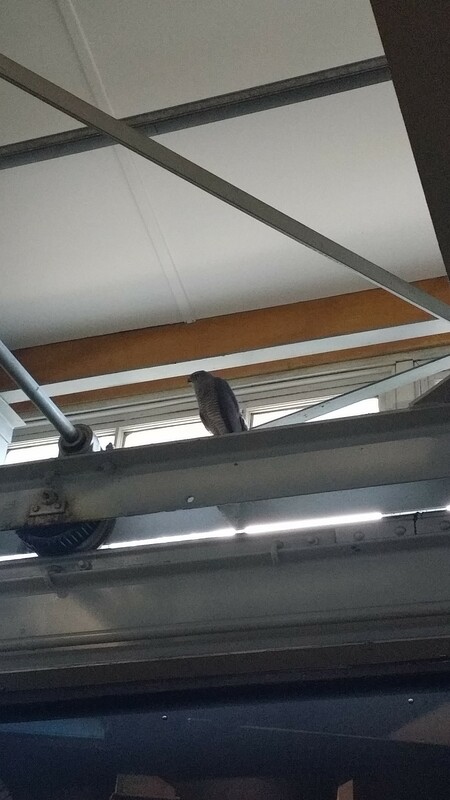 So it was surprising when a goshawk was spotted sitting on the rafters in Building 46, Newington Armory, by Education Officers and a group of students. The raptor attempted to fly out through windows at either end of the building every so often. Unfortunately staff could not open the windows to let the bird escape. When the school left, Education officers turned the lights off and left the doors open in a bid to encourage the bird to leave, to no avail. The goshawk stayed up high and eventually hit a window and knocked itself out. The quick-thinking officers covered the bird and placed it in a big tub, to be taken to the vet. After an hour or so, the goshawk was sitting up and alert, so the officers released it and it flew off in the direction of Newington Nature Reserve forest. Window strike by birds is not unusual. If you see a concussed bird on the ground please alert Park Rangers or Sydney Olympic Park Authority staff immediately so the bird can be taken into care. You can assist by placing the bird in a large container with adequate ventilation and keep it in a dark and quiet place. ‹ Lunch at Brickpit Park? How’s his headache though? Glad to have a happy ending. I had two magpies crashing into my kitchen windows from sunrise to sunset last spring, literally. The nest in a rear tree had been a regular birthing centre for a few seasons but only last year did this occurrence take place. It was quite distressing and frightening watching them repeatedly crash into the windows. The nest was not used this year. Thank goodness! Hi Karen. It was a very good outcome for the goshawk! It was not the intention of the staff for it to hit the window, but it facilitated in the bird getting out. Birds may accidentally fly into windows as they cannot see the transparent glass, making them think they are flying into open air, or they may attack their own reflection in glass thinking it is another bird. This is particularly prevalent during the breeding season but can occur at any time, and may be the reason why the magpies at your place were crashing into your window. Unfortunately the impact of hitting a window can stun the bird or cause serious injury and even death.